A massive, muscular dog, the Irish Wolfhound is one of the tallest breeds in the world. They have a rough, shaggy coat and wiry bushy eyebrows. Colors include gray, brindle, red, black, or white. 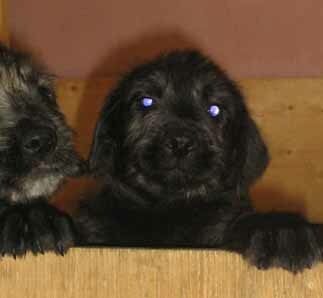 Irish Wolfhounds are a sweet-tempered, patient, generous, thoughtful and very intelligent animal. They can be trusted with children, but are not a guard dog by nature. Wolfhounds are a giant breed and can be clumsy. Slow to mature, it takes two whole years before they are fully grown. Average height of a wolfhound is 28-35 inches (71-90 cm), weighing 90-150 pounds (40-69 kg). The Irish Wolfhound is not recommended for apartment life. They are relatively inactive indoors due to their size, and will do best with at least a large yard. They need to be part of the family and would be very unhappy in a kennel. Being sighthounds, they will chase anything that moves, and so need a secure, fenced area for exercise. These giant dogs need lots of space to run, but do not need any more exercise than smaller breeds. Puppies should be allowed to choose how much exercise they need. The rough, medium-length coat needs regular and thorough grooming with a brush and comb. Irish Wolfhounds have an average life expectancy of 6 – 8 years.